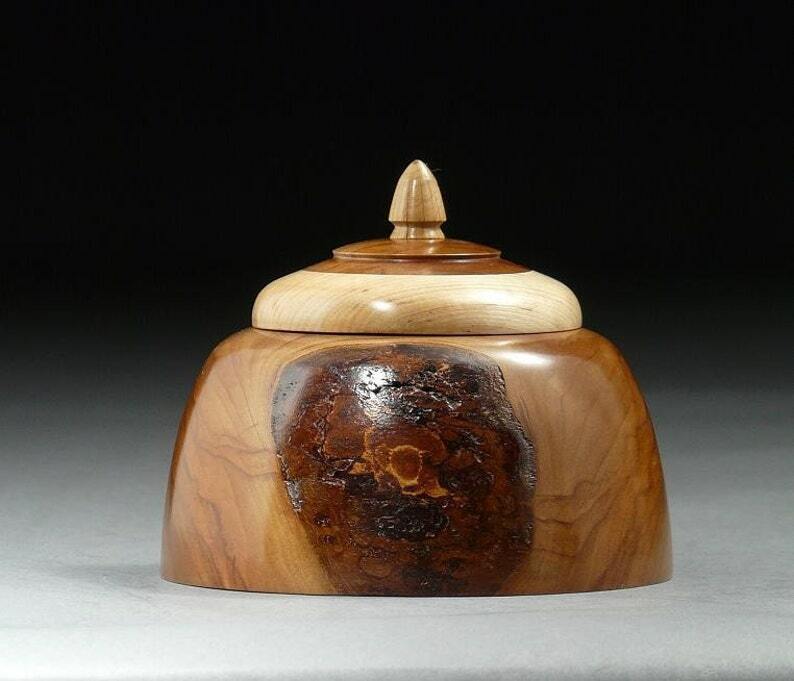 If you appreciate woods with warm, rich color tones, you may like this Japanese Cherry lidded keepsake box. Its focal point is a shield of reddish brown inner bark on the front, surrounded by classic Cherry wood grain with dark veins streaking up and away to the sides. The coarser texture of the bark is a contrast to the fine, dense, smooth Cherry wood. The lid, which is easily removable with one hand for convenience, is of Hophornbeam, with an inlay of Cherry, and a finial of Rhododendron. Echoing the off-white of the Hophornbeam lid is a round inlay of Hophornbeam in the bottom of the box, which helps to light the interior. At 4-3/4 inches in diameter, 4 inches in height, this rich looking keepsake box is just right for secreting away some of those little treasures that need a home. The box has been finished with a durable urethane oil, and brought to a very smooth semi-gloss lustre by buffing and polishing with hard wax. Item # BX40, Japanese Cherry Keepsake Box.